I am a person that loves to write. I say write not type, typing to me can be so laborious that a lot of times I want to pay somebody else to do the dirty work for me. I write with a ball point pen, but as we all know when using ink, there is always the chance that you make that one crucial mistake that turns your nice paragraph into an eyesore with scribbles. I think we all know handwritten cards and letters hold more meaning than an email, something is more personal about it, more romantic and truthful, no spell check, no grammar check, just stream of consciousness. That is why I was really excited to try the Pilot FriXion Ball Erasable Gel Ink Pen. As I mentioned, I love to write and the beauty of these pens is the way the ink flows. Most erasable pens you come across leave you with very light and crusty print when put to use, not these beauties. These pens are very inexpensive and come in a variety of colors. The pens use a thermo-gel that reacts to heat, that is how they are able to erase. There are no more eraser shavings to worry about dirtying up your desk and lap, the ink on these babies disappears from the heat created by the friction of the eraser nub at the tip, genius. This pen gets a thumbs up from me and at less than $4 it is a great deal, and they can be refilled - what is there not to like? 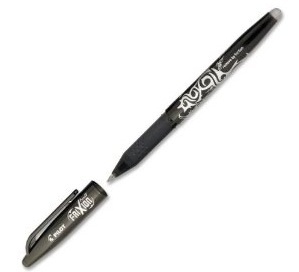 So the next time I am taking notes or writing a card, I will be reaching for my Pilot FriXion Erasable.